Okay, so this is a very late post! Things have been a bit full on since my last update, which was back in August! I’m going to explain what’s been going on in this gap in my next post in a week or so. This one, however, is dedicated purely to my 30th birthday back in October – and what I did for it. Most of my birthdays over the last decade have been celebrated with friends and copious amounts of alcohol. This year, for the big three-zero, I’ve been in Australia (duh) and while I do have friends here, most of my good friends I’ve met are in other places in the country, so I was feeling a little lost as to what to do. Also, while I wouldn’t mind going out and drinking, this is a big one so I wanted something a little different. My first plan was to go to Hobbiton in New Zealand but money prevented that from happening. The idea of a trip still appealed so I looked for something else and I found a day tour, on my birthday, to a place not too far that as been on my list for a while. It meant a day out alone (not counting other people on this tour) but it was a memorable way to spend my birthday. I decided on a tour to Phillip Island, which ended with the Penguin Parade. 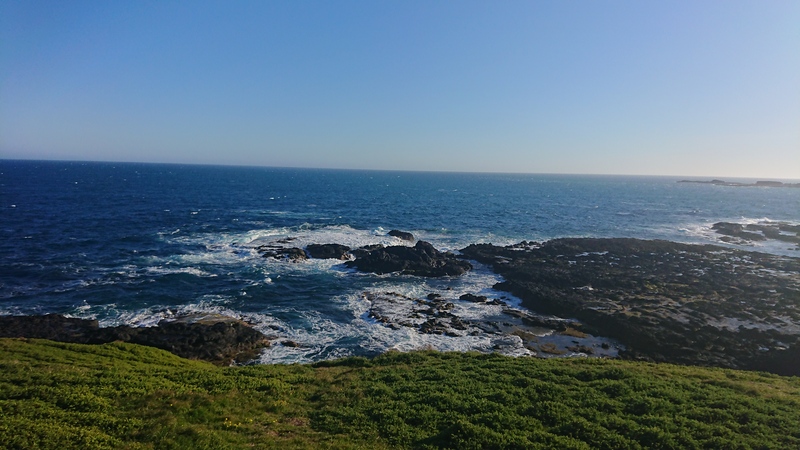 The journey was a good few hours but the tour was able to break this down on the by stopping at Moonlit Sanctuary, which is about half way between Phillip Island and Melbourne (there was no stop on the way back but it was so late and long day, most of us took a nap). This was quite a small wildlife park compared to some I’ve been to since arriving in Australia but that actually worked to its advantage. We had a barbecue lunch and had some time to walk around and explore. 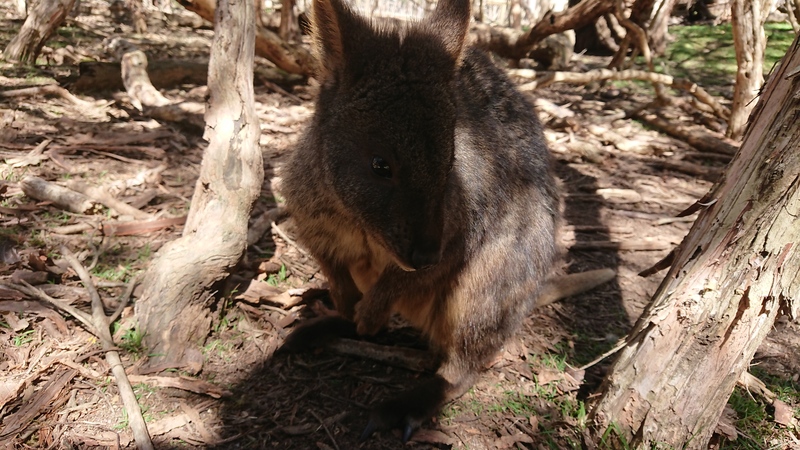 Plenty of different animals to see and learn about but the real highlight of this place is at the back where there were kangaroos and wallabies to feed and get pictures with. I even fed one with a joey peeking from the pouch! The highlight here, however, as a baby koala on one of its first talks with people around. It had only been out in the world for a couple of months or less and it was very curious and a lot more active than most koalas I’ve seen. I probably could have spent all day at Moonlit Sanctuary but before I knew it, we were off again. Our first stop on Phillip Island was at a heritage farm, which was a nice place to wander around and look at. More animals and a bit of history but the next stop was more interesting. 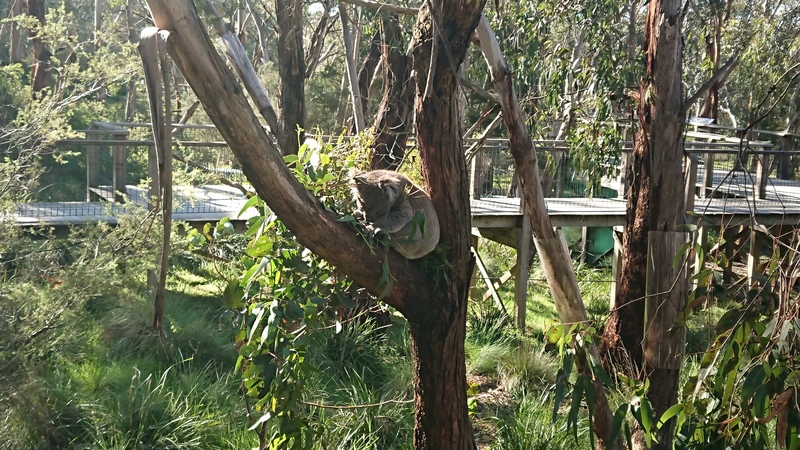 We had a bit of time to stop by a koala sanctuary on the island. Now, yes, I’ve seen plenty of koalas already but they’re so cute! There are different enclosures with boardwalks to explore and I managed to see half a dozen or so, mostly all close together. The highlight of the tour is the Penguin Parade. We had some time to kill so I grabbed some food and took a seat in the stands. As the sun dropped so did the temperature and I was glad to have brought a coat on an otherwise hot day. Some penguins marched out to see but more were returning and it didn’t take me long to realise there were better spots to be. I camped out along one of the main ‘paths’ and watched a lot of groups of penguins march by, some breaking off as they reached their homes. They were constantly looking at the people and making plenty of noise. There were a few little scraps as well but it was definitely an interesting sight to see so many marching penguins – unlike St Kilda where you’re lucky to see more than a few at a time. It was a lovely way to finish the day and tour before the long bus ride back home. Unfortunately, there was no photography allowed of the penguins. Flash photography can really damage their eyes and to make sure there’s no accidental camera flashes, all photography is banned and there are plenty of staff making sure no photos are being taken. There is an app with photos they’ve taken but it’s not the same so I decided just to remember the little birds on my own. The day did end with a few drinks but all in all, it was a great way to spend my birthday. A lot more chilled than the ones over the last decade or so.